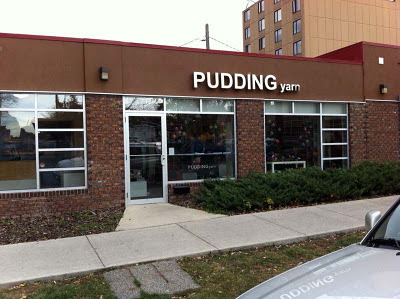 I've now visited all the yarn stores in the Calgary area, all that I'm aware of at any rate. If I've missed any, please let me know. 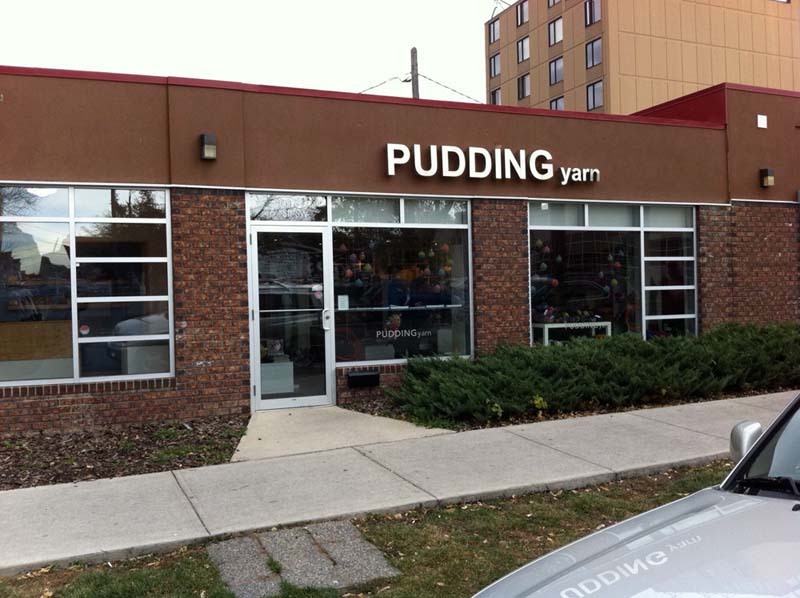 The latest one I visited was Pudding Yarn. I went there a few years ago on a visit to Calgary, so this was actually a re-visit. The store is small, but obviously popular judging by the number of people who were shopping. 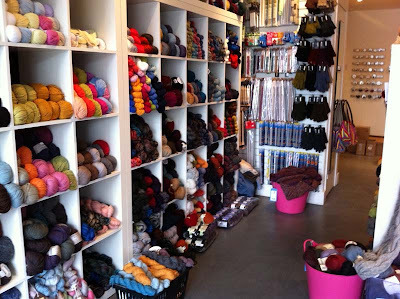 There was much more yarn than I remembered from my first time there, filling the shelves and spilling out. A great deal of it is from my favorite company, Rowan. This alone gives me a great reason to visit again. 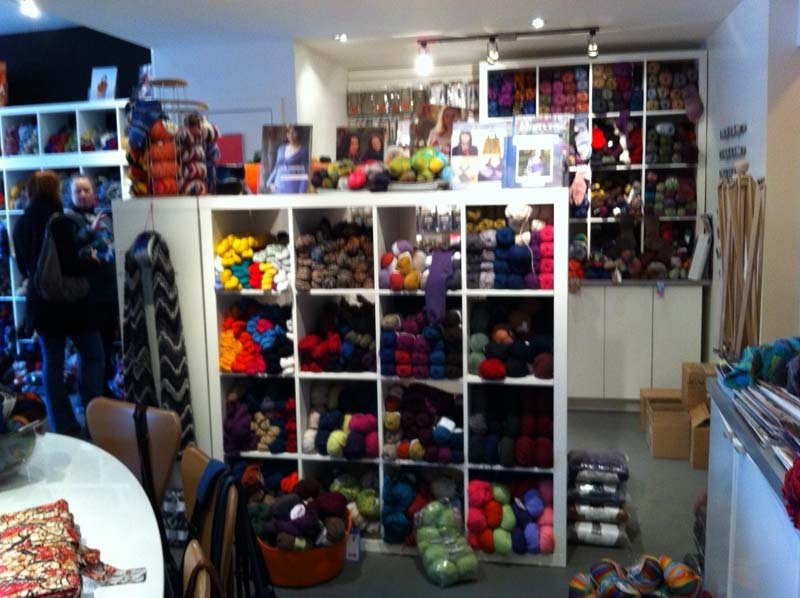 Now I now where to go for my Rowan fix! One small ball (25 g) of Rowan Fine Tweed followed me home. It reminds me of some of Rowan's early yarns that I liked so much. This ball, a deep red color (#369, Bainbridge) is just for swatching. I have no doubt that one day I'll use this yarn for a project... in the distant future. One of the things that I like about Canadian yarn stores is the availability of straight knitting needles. I prefer straights most of the time, depending on the project, of course. Other than the small ball of yarn, one other item came home with me, a Peep Sheep rubber coaster from Herdy. Isn't it cute? Now tell me, how was I supposed to resist? It was difficult enough trying to decide on the color.